World AIDS Day is December 1, 2008! Some of you may be asking, "World AIDS Day? What?" As described by the World AIDS Campaign, World AIDS Day is the day on which individuals and organizations from around the world come together to bring attention to the global AIDS epidemic. Each year is given a theme, and the theme for 2008 is "Stop AIDS. Keep the Promise - Leadership." How did World AIDS Day start? The WAC's slogan for their work is "Stop Aids. Keep the Promise." This is an appeal to governments, policy makers, and regional health authorities to ensure that they meet the many targets that have been set in the fight against HIV and AIDS, and especially the promise of universal access to HIV treatment, care, support, and prevention services by 2010. 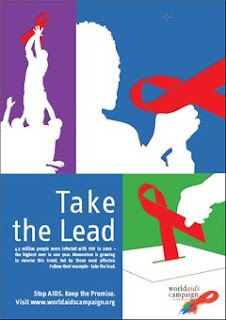 The campaign will run until 2010 with a related theme chose for World AIDS Day each year. World AIDS Day serves as a key opportunity that can be used to promote HIV/AIDS awareness and call others to get involved to combat this epidemic and help save lives. Wondering how you can get involved with World AIDS Day and do your part? Check out http://www.worldaidscampaign.org/en/Get-Involved. Also, continue to check back on the blog for World AIDS Day events and more information.